This Series is a range of high quality, low cost, compact sensors which measure the temperature of inaccessible or moving objects and materials. They measure temperatures from -20 to 500°C (-4 to 932ºF), accurately and consistently, with an outstanding response time of 240 ms. Infrared (IR) sensors are available as either 2- or 4-wire units. 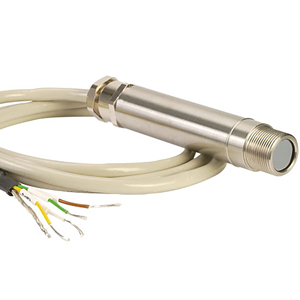 Twowire IR sensors transmit the target temperature as a 4 to 20 mA output and offer a simple solution for most non-contact temperature measurement applications. Four-wire IR sensors transmit the target temperature as a 0 to 50 mV or thermocouple output (Type J, K or T) plus the internal sensor temperature as a 4 to 20 mA output. This second output can be used to ensure that the sensor is being operated within the correct ambient temperature limits and prevent damage caused by overheating or overcooling. It can also be used to give an approximate indication of the air temperature surrounding the sensor. IR sensors are fitted with precision germanium lenses for accurate optics.